Longtime Seattle Times chronicler Bill Richards has the cover story of monthly Seattle Business. In it he reveals some interesting new details behind the turbulent past decade of the newspaper company and has an unflattering assessment of CEO and Publisher Frank Blethen. 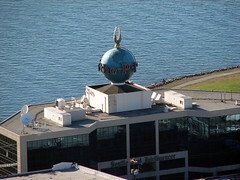 In "Blethen's Choice: Decisions made to pull the family together have weakened the Seattle Times," Richards suggests that a deep history of dysfunction among members of the Seattle-area Blethen family, which has controlled the privately held Seattle Times Co. since 1896, shaped the small newspaper chain's character in good and bad ways. Frank Blethen, Richards reports, saw the company as something of a salve for familial wounds. But while the family's growing emotional attachment to the newspaper company resulted in kinship and good journalism, that passion also led to a number of bad business decisions that hurt the company's chances for survival in the digital age. Says Tony Ridder, the former Knight Ridder CEO whose company owned 49.5 percent of the Seattle Times Co.'s voting stock: "The Seattle Times was a good newspaper. But Frank absolutely did not make good business decisions." Richard Connor says he and HM Capital, a private equity firm in Dallas, have finally raised the cash necessary to close a deal announced last year — purchase of Blethen Maine Newspapers from the struggling Seattle Times Co. The price has not been disclosed, but unloading the three dailies and other properties in the other corner of the country is hugely important for the survival of The Seattle Times and its smaller siblings in Washington. The papers to be sold are the Portland Press Herald and Maine Sunday Telegram, the Kennebec Journal in Augusta, the Morning Sentinel in Waterville, plus a weekly and a Web portal, MaineToday.com. The union representing many workers at all three papers is to vote on concessions this week, including a 10 percent wage cut, according to the Press Herald. In an effort to repent for the sin of being a professional journalist, I've been following Jeff Jarvis' blog, BuzzMachine, which is a good deal about what idiots professional journalists are and how cool Google is. OK, I exaggerate. But Google has made Jarvis rich, compared to most Americans, and he doesn't even work there. He is the author of What Would Google Do? I don't know if his book is any good because I haven't read it, even though you can read it for free online. (I am now only reading books whose authors pay me.) But I do read Jarvis' blog, and it is provocative, and sometimes I even agree with him. The other day Jarvis wrote about another blogger's essay. The other blogger was writing about Google's influence on the news business and, among other things, how people like Jarvis think it's a good thing, when in fact it's not. (Meta alert: I am now writing about a second writer writing about a third writer who is writing about the second writer.) Jarvis contends that, by its very existence, his own blog post about the other writer's essay proves Jarvis' point. To understand this, and I'm not sure I do, you need to read Jarvis' post. True enough, though, is that Jarvis writing about this other essay caused me to read the other essay, too, and reading the other essay enabled me to conclude that Jarvis is, actually and in point of fact, wrong in his assessment of the other essay. The third writer, being correct, deserves his own paragraph of introduction, and I urge you to read his blog post, a small portion of which I quote below. He is Josh Young. The blog is called Networked News, and his essay is titled, "Not By Links Alone." I am about to pitch a worthy cause, but I don't want to do so without exploring what that means for me as a journalist. I haven't until now gotten involved in raising money for philanthropies, mostly because I have been in the news business for more than 30 years and I have always believed that the best thing I can do for society is do that one thing well. And to do it well I need to be detached. I haven't made political contributions. I don't even sign petitions. Once you associate yourself with a point of view in a traceable way, however benign that point of view might seem and however self-evident is your right to do so, you make it harder to move credibly in multiple circles of influence and opinion, and journalists need to move in multiple circles with a minimum of baggage if they are to assemble a semblance of the truth. That notion is laughed at by many non-journalists and, increasingly, by journalists, too. In the Internet era, the vogue thing to do is let it all hang out, to wear your biases on your sleeve. It's a valid state of being but one fraught with its own limitations, starting with a lack of credibility among those who don't share those biases. That leads to diminished access and influence, and worthy journalism is influential. I meant last week to call attention to some thoughtful analysis of the internecine debate over the future of the news business but got distracted by a nearly fatal collision of personal circumstance. A flame war broke out recently over how to pay for journalism, and in a lengthy examination of it John Zhu offered some worthy advice to rock-star news visionaries who are derisive, or at least dismissive, of legacy journalists struggling to save their business during this economics sea change. The images below pretty much tell the story. If you're going to claim breaking news as your bread and butter, you open yourself to extra scrutiny. The Seattle Post-Intelligencer was on top of an aviation emergency, but a hastily written story was posted with equal haste, apparently without editing. For the non-copy-editors among you, there are three problems: a missed capitalization in the headline ("Sea-tac" instead of Sea-Tac), and, in the "lede graf," incorrect use of the plural form of smoke and citation of the wrong day. Within moments, an unforgiving reader spotted it. Two of these three errors were corrected about 15 minutes after the original post. In the age of print, this sort of on-deadline flub would be a big, embarrassing deal. Online-only, I don't know — not so much? What do you think? Does anyone care anymore? Tackling the news-technology challenge: GonzoCamp! ... We're looking for tech-savvy journalists, programmers, designer/developer/UI people, entrepreneurs and some college students. We'll be relying on folks like you to work your networks and help us get the right people there. The event is co-sponsored by the University of Washington Master of Communication in Digital Media program, the Online News Association, and Serra Media, a Seattle developer of news software applications, including NewsGarden. I don't know the first thing about the advertising business, but it doesn't take a madman to see that locally focused advertising online seems stuck in the 1990s, whereas the content side of the equation is bursting with new ideas and experimentation. To my knowledge, venerable local news outlets and even innovative new ones have not given fresh thought to the way advertising is sold, or what it is or should be. While there are plenty of Chuck Taylors out there who have good ideas about news content and how it should be presented online, I know of no one on the ad side with whom to team up who is bursting with ideas about how to efficiently and creatively tap what has to be massive potential local revenue. Content Editors contribute to this team by handling escalated cases for reviews, communicating to various teams about reviews, providing daily/weekly/monthly/ad hoc reporting, and resolving change requests (cases) submitted by hotels and internal customers. Cases range from simple (review removal) to very complex requests (brand reporting). Content Editors work closely with market managers, hotel partners, international content teams, star ratings teams, retail POS contacts, and customer operations teams. John Hamer, the executive director of the Washington News Council and a former Seattle Times colleague of mine, says the organization he helped found a decade ago is at a crossroads. At a time when media criticism can be practiced by anyone with a blog, and when media performance is critiqued in real time, what role should WNC play? Newspapers and Thinking the Unthinkable — Media consultant and educator Clay Shirky is widely misunderstood among traditional journalists who see him as delighting in our failure to get it. Actually, he values good mainstream journalism as much as we do. In this long essay he explains the reality we all must face. 2020 Vision: What's Next for News — This thoroughly linked outline of what might happen as newspapers continue to decline in influence is one of the most-detailed and likely prescient things I've seen. By longtime journalist Dan Conover. Now that some of us have dismissed the new, online-only Seattle Post-Intelligencer as an utter failure 24 hours into the experiment (yes, day two was much better, and, truly, I wish them well), it's time to anticipate the longer-term future of Seattle journalism. Some context: Before Hearst on Monday announced that the P-I would, indeed, cease the use of ink, people at the paper were twisting in the wind. For weeks, no one knew what would happen. Then a few weeks ago a magic wand tapped some two dozen of the 170 news employees on the shoulder to join a possible new online-only venture — the SeattlePI.com effort now under way "to break a lot of rules that newspaper Web sites stick to." This bifurcation of the staff upped the levels of anxiety and insecurity in the final days and hours, naturally, which helped inspire another handful of P-I journalists to consider striking out on their own once the severance checks are safely deposited. These folks, who wish to remain nameless until the Hearst checks clear, asked me to advise them. (Now between jobs, I worked for a long time at The Seattle Times, organized and ran the Seattle Union Record during the 2000-01 newspaper strike, was managing editor of Seattle Weekly, and was the launch editor of Crosscut.) So far the relationship with these now-former P-I staffers is informal and free, but it's possible I could get more involved at some point. Anyhow, through this connection I've been privy to discussions with others in Seattle — including non-journalists — who are concerned about the future of local news. After all, The Seattle Times is in a precarious way, too. 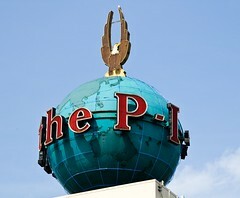 On day one, what's in the new P-I? As I write this, the top story at the new online-only Seattle Post-Intelligencer, as it has been for at least 12 hours, is a photo of a cute puppy and a headline and blurb that link to a six-sentence blog item about adopting that and other puppies. The No. 2 story on the home page is a headline that links to a five-sentence blog item about the state revenue forecast. That blog item quotes The Associated Press, but there is no link to more information. The No. 3 story is a headline that links to a four-paragraph AP story about how it's illegal to bet on basketball tournaments in Washington. Under the section listing items from the Seattle 911 blog, a headline: "Feds hit WaMu." (Um, that's a 911 call?) This links to a one-paragraph blog item, which, in turn, links to the Seattle Times scoop about the grand jury investigation of Washington Mutual. This is one of a series of posts by me and Mark Matassa about the decline of the newspaper business and what that means for Seattle journalism. Complete sequence of previous posts: 1, 2, 3. Two or three senior-level editors or producers. I see six people who actually would do newsgathering. Mark, will the online-only Seattle P-I live up to its nameplate? And why would I go there to begin my news scan instead of The Seattle Times? Will the residents of metro Seattle be receptive to an emaciated news outlet? Contrary to rampant rumors that Hearst might shut down the print edition of the Seattle Post-Intelligencer as soon as this Saturday, March 7, P-I labor relations rep Matt Lynch tells the Pacific Northwest Newspaper Guild that everyone should assume that March 18 will be the last day of publication and the last day of work for most employees, writes the union's administrative office, Liz Brown. In a memo to P-I staffers, Brown points out: "Remember, the WARN Act notice said the P-I would cease publication 'no sooner than March 18 and no later than April 1.'" The wiki I set up over the weekend, the Seattle Post-Post-Intelligencer, has had some encouraging early activity, including the first public posting of a proposal to create a community-owned news organization a la the Green Bay Packers and heated comments over micropayments. If you haven't had a chance, please check it out. It's a place to imagine what a next-generation Seattle news outlet might look like. It's open to everyone. You can participate in discussions of topics and edit pages. Like the old-school, curmudgeonly dinosaurs lamented in these recent panels, I find myself naysaying a lot of stuff without offering any genius ideas of my own. One difference, maybe: I welcome the new. In fact I launched my own online news digest site 10 years ago, worked for MSNBC.com at startup three years before that, and have been a big advocate for Web-first, blog-centric and Twitterific reporting ever since. Complete sequence of posts to date: 1, 2, 3. I've started a wiki called the Seattle Post-Post-Intelligencer, where I hope any and all will lend their minds to the task of imagining a next-generation news outlet for metro Seattle. It begins with a list of topics I think need to be considered, but I'm happy to let this thing take on a life of its own. My only preconception is that we want something pro-am — that everyone recognizes that whatever this could be, it should be something to foster both professional and citizen journalism. Please have a look and let me know what you think. Little noticed so far is news that Hearst, owner of the struggling Seattle Post-Intelligencer and San Francisco Chronicle — hell, their whole newspaper chain is struggling — has struck a deal with Helium, a Massachusetts-based Web site that coordinates freelance citizen journalists, to provide content for Hearst newspapers. The deal gives the newspaper publishing arm of New York-based Hearst Corp. access to Andover, Mass.-based Helium’s marketplace of freelance writers. The marketplace enables Hearst to essentially put out to bid stories for competition on a range of topics. Freelance writers can submit content through the site, and Hearst then chooses the best stories and compensates the writers.